Sebastian Vettel has lived through a number of false dawns at Ferrari but bright sunshine bathed the team's garage after the German's Australian Grand Prix victory in Melbourne yesterday. The four-time world champion cruised to his second win at Albert Park and 43rd overall with a nearly 10-second gap over Mercedes runner-up Lewis Hamilton, proving the Ferrari cars' encouraging winter testing was not just a mirage. A gloom has hovered over Maranello for a number of seasons and it seemed at its most thick last year as Vettel and Kimi Raikkonen failed to win a race amid reports of disharmony in the team garage. But it was all bear-hugs and back-slapping yesterday as Vettel crossed for the team's first win since his last victory at the Singapore Grand Prix in 2015. 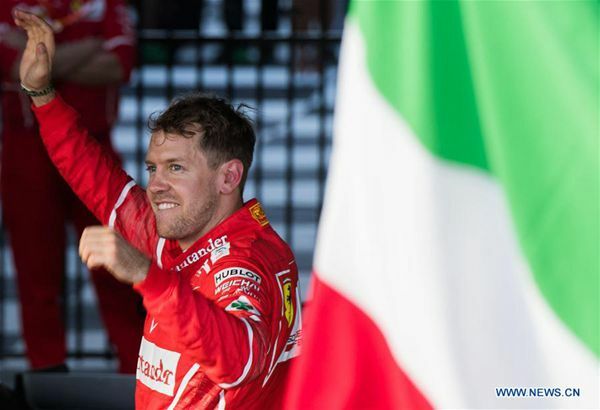 "We say this all the time, what this team has done in the last six months has been really tough, rough as well," a beaming Vettel told reporters. "(It's) not (been) easy to manage the whole team, but I think the new car in general obviously is fantastic and this is a great reward, a big relief for everyone. There's been a lot of ups and downs, left and rights in the last 12 months. "The big difference was being able to deliver a really good car. "I saw the guys (in the garage), they were smiling and singing, I'm sure we'll see some more of that. But... it's just the beginning. Motivation has been really high but obviously it helps to wave from the podium." Vettel started second on the grid and had a poor start to give Hamilton clear air but the Mercedes driver pitted early to change tires after complaining of poor grip. Luck played a part in Vettel's fourth win with the 'scuderia' as Hamilton re-joined the race behind Red Bull's belligerent teenage racer Max Verstappen who was not about to let the Briton pass. After his own tire-change, Vettel re-entered the race with perfect timing, sneaking in front of Verstappen and Hamilton before forging ahead to close out a dominant win. His teammate Raikkonen finished fourth behind third-placed Valtteri Bottas, who made his Mercedes debut after crossing from Williams. Jock Clear, Ferrari's head of racing activities, said he was uncertain whether their cars were quicker than Mercedes in "absolute terms." Vettel was also not getting carried away about his prospects of winning a fifth title. "It's not the time to look at the table. Step by step," he said. "(There are) new rules, regulations and generations of cars. "(Mercedes) made good steps forward and we are the ones that need to catch up. Whatever happens this year, the race today doesn't hurt." Red Bull was well off the pace with Verstappen placing fifth — almost 29 seconds behind Vettel — and local hope Daniel Ricciardo failing to finish. Ricciardo's day started badly and kept getting worse as he got a grid penalty, missed the start after a mechanical failure in the warmup, and then retired after 28 laps. He was among seven drivers who retired in the race. Former champion Fernando Alonso continued to struggle in his McLaren, retiring on the 50th of 57 laps, while 18-year-old Canadian rookie Lance Stroll was handed a grid penalty after needing an unscheduled gearbox change after a crash in practice and was wayward in his 40 laps on debut for Williams. Felipe Massa earned points for Williams with a sixth-place finish, while Force India teammates Sergio Perez and Esteban Ocon were 7th and 10th in their pink cars and finished either side of Toro Rosso drivers Carlos Sainz and Daniil Kvyat.